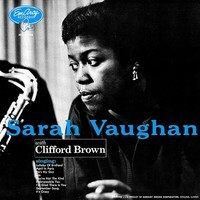 Sarah Vaughan (1924 - 1990) was an American jazz singer, who along with Billie Holiday and Ella Fitzgerald to the greatest projected in its genre. She is known for her expressive voice, unique vibrato and wide vocal range. Bop's greatest diva, a highly influential jazz singer with extraordinary range and perfect intonation, ranging from soft and warm to harsh and throaty.